Streams can be created when your users create recipes or leave recipe reviews. They can be given points and they can also receive badges. NS Recipes comes with 4 user points rules: create recipe (+5 points), remove recipe (-5 points), create review (+5 points), remove review (-5 points). You can update the number of points for each rule in EasySocial back-end. NS Recipes comes with 2 badges: "Food Lover" (10 recipes reviewed) and "Grand Chef" (10 recipes created). You can update the number of achievements for each badge in EasySocial back-end. Download and install NS Recipes EasySocial Integration plugin. Go to Extensions > Extension Manager, install plg_nsrecipes_easysocial zip archive. Go to Extensions > Plugin Manager, look for the plugin and edit it. Use stream: add an activity stream when user reviews or creates a recipe. 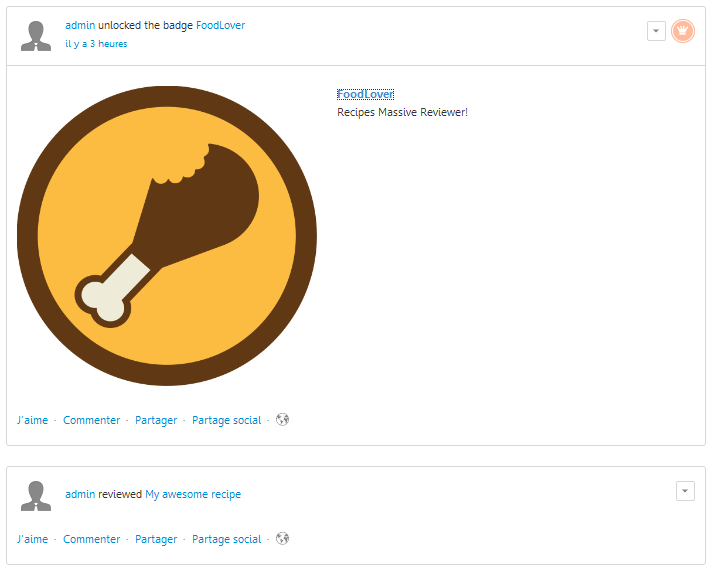 Use badges: keep track of the number of reviews and recipes created to give badges. Use points: gives points to users when they create recipes or reviews, will withdraw points when deleted. Show Title: Toggle title in stream. Show Picture: toggle picture display (when available) in stream. 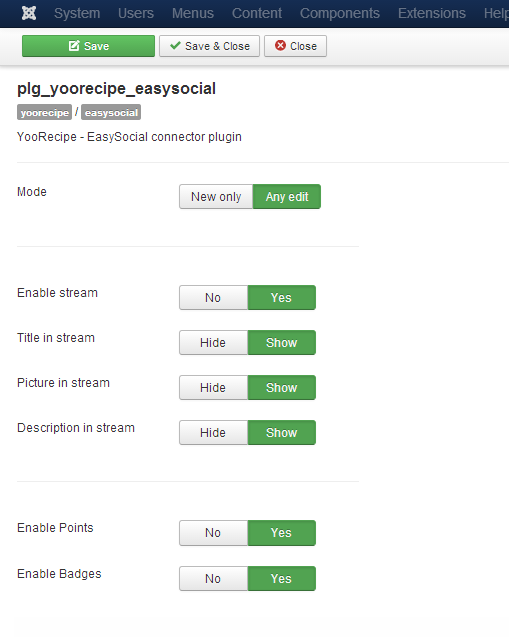 Show Description: toggle recipe description display in stream. By default, pictures are resized to 100x100 pixels. By default, description is shortened to 200 characters max. There is nothing special to achieve. Basically, you just need to discover NS Recipes User points and Badges rules. 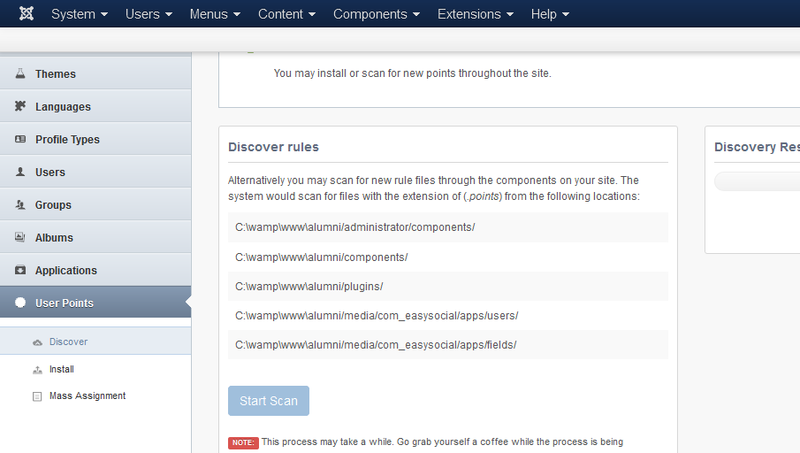 Go to Components > EasySocial > User Points > Discover > click Start Scan button. Once points have been discovered, click on the "User Points" menu item. You can now enable/disable rule points, update the points granted or deducted. 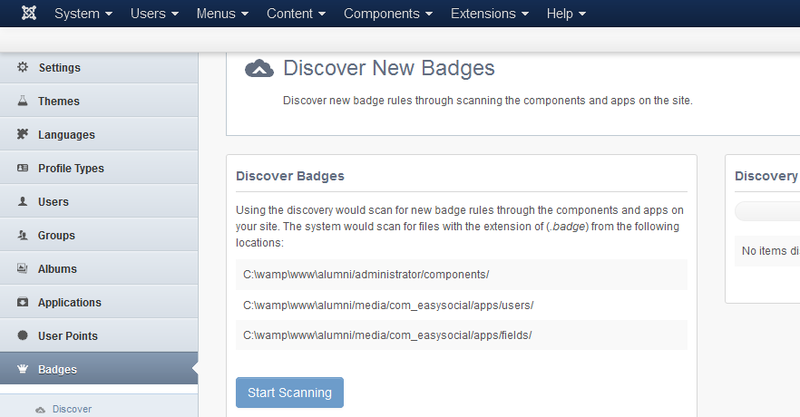 Go to Components > EasySocial > Badges > Discover > click Start Scan button. Once badges have been discovered, click on the "Badges" menu item. You can now enable/disable badges, and update their settings. If the plugin option is enabled, your users will see who created a recipe or posted a review on a recipe. If plugin option is enabled, your users will see how many points they have been awarded when creating recipes or leaving recipe reviews. If plugin option is enabled, your users will see the badges they received.